A recent SNL skit on Millennials humorously portrays the workplace generation gap, with Millennials (defined as “twenty-somethings”) expressing their expectations for career advancement. Often overlooked, however, is that during their 20s, Millennials transition through dramatically different lifestages. By the time they are 25-29, fully 45% of women are married and another 17% are co-habitating, with 7% divorced, widowed or separated. Only 31% are single. 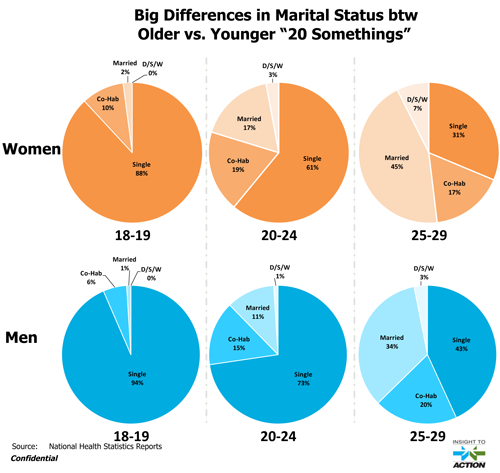 By comparison, at ages 20-24, almost two-thirds of women are single (61%). Men follow a similar pattern, with a slight delay so that the age of first marriage is 28 for men and 26 for women. Marriage or living together changes many spending dynamics and may also impact the outlook on work. The impression of the SNL skit is of younger MIllennials (20-24) who are interested primarily in themselves. The ‘twenty-something’ depiction also ignores the large group of Millennials who are 30+, many of whom are parents. Having a child in the household is another huge milestone that can impact work outlook. In fact, the demographic reality is that the average age of a 1st time mom is currently 25, though this does differ by multi-cultural group. It’s not that hard to get the voice of a Caucasian, suburban Gen X mom in her late 30’s or 40’s. And Baby Boomers are easier to reach, as well. But to truly understand segments within the Millennial generation, more effort than pulling a general sample is needed. There are many important diverse voices. Let’s look at a category-specific example. It’s been widely reported that Millennials have a different outlook on convenience store prepared foods than previous generations, and are now using them more frequently. Some of the reasons given for convenience stores’ popularity with Millennials include upgraded product offerings, reasonable prices and convenient fit with these impulse buyers. This top-level understanding is a starting point. Insight to Action had the privilege to work with a leading manufacturer of convenience store prepared foods who took the time to go to a deeper level of insights, understanding Millennials by multi-cultural group and by age range, as well as gender and working status. It may not seem intuitive from the SNL skit, but older Millennials (25-34) are more committed, regular users of convenience stores prepared foods. Here’s some insight into why. If you think about the lifestyle of a 25-34 year old, working, married man, with or without kids, he is in an established job and work routine. That makes him more likely to eat lunch and breakfast away from home at convenience store(s) along his work commute or travel from job to job. By comparison, the younger male or female Millennial ages 18-24 is less likely to work full-time, and more likely to be a student. These younger consumers have more mixed opinions about convenience stores, with distinct attitudes towards convenience stores, along with their preferences for food types within the stores. The insights go even deeper when considering Spanish vs. English speaking Hispanics, African American, and Asian American Millennials. This type of highly proprietary information gives our client a competitive advantage, and the company is sharing it selectively with their customers, convenience store chains. Too often, research studies call for ages 18-49 (which goes beyond Millennials) without paying attention to the differences between younger and older Millennials, among multi-cultural groups or relating to gender. So, when you see a generalized finding of Millennials, it’s worth taking the time to understand the points of commonality vs. differences within this large group.